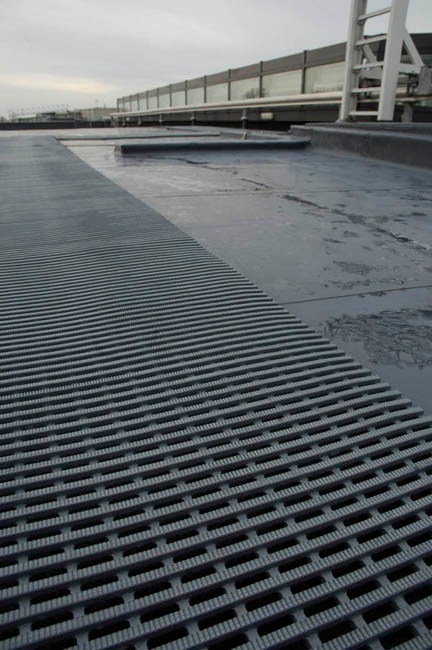 FiberTite Crossgrip is a two-layer roof walkway matting that protects the roof membrane, provides safe access for general maintenance works and is compatible with various roof surfaces. Made from non-porous PVC with cross-directional top ribs and a 'diamond cut' surface for a firm underfoot grip, Crossgrip carries a 0.6/0.5 slip-resistant rating under ASTM 1677. Impermeable in all weather, Crossgrip is a highly specialized matting system for flat roofs, gantries and high-level walkways. When laid flat it will remain stable in winds up to 60 mph (96 km/h*). FTR Crossgrip is a loose laid roof walkway system designed for roofs with heavy maintenance traffic or extreme elements that make roof access challenging. FiberTite Crossgrip is an all-weather solution that can be repositioned, is self-draining, and is highly slip resistant. Proudly made in the United States, FiberTite currently stocks rolls of Gray Crossgrip 2' wide x 33' long (3' and 4' widths x 33' length sizes are available by special order). FiberTite Crossgrip is a heavy-duty alternative to welded walkway systems and has gained "traction" in the industry. FiberTite Mellow Yellow roof walkways material offers a UV-stable yellow pigment and deep herring bone ribbed texture to improve footing on wet surfaces. FiberTite Tuff-Trac features FiberTite XTreme membrane's 46 x 44/1000 x 1000 denier woven polyester fabric reinforcement. It is embossed with a low profile diamond plate design. FiberTite Grey low-scope protection pads are manufactured from high grade vinyl and offer a deep herringbone ribbed embossed surface texture. *Tests at the University of Hertfordshire, School of Aerospace, Automotive & Design Engineering showed Crossgrip PVC When laid flat on a stable platform remained in position for wind speeds of 94 mph (150 km/h).